The Powhatan Arrow, WATX 539, will add the final touch to your high-density seating requirements for your rail travel plans, reminiscent of the golden years of passenger train service. Restored to its original 58-seat coach configuration, the seating area has been refurbished in a beautiful manner while keeping dependability, quality, and comfort as the key objectives. Adjustable seat backs and long-distance leg rests offer a comfortable ride. The beautifully decorated and spacious rest rooms with retention toilets at each end of the car add convenience. The climate control heating and air conditioning system maintains a nice environment inside the car. Traveling on the Powhatan Arrow will be a unique experience for your passengers. The Powhatan Arrow is AMTRAK approved with head-end power, 27-point connection, main reservoir airline, MU (Push/Pull) Connectors and Superliner compatibility. The car is fully self-contained with a generator. 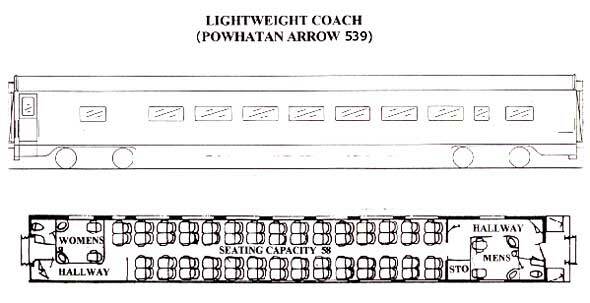 HISTORY: In April of 1946, the Norfolk & Western Railway ordered ten 58-seat coaches for the Powhatan Arrow and Pocahontas from Pullman-Standard. The cars were delivered from October through December of 1949. They were built with smooth sides and painted in N&W’s tuscan red and black. Car numbers were numbered 531 to 540. Out of the ten cars in this series, eight cars are still in some type of operation. The #539 operated between Cincinnati, Ohio and Norfolk, Virginia. 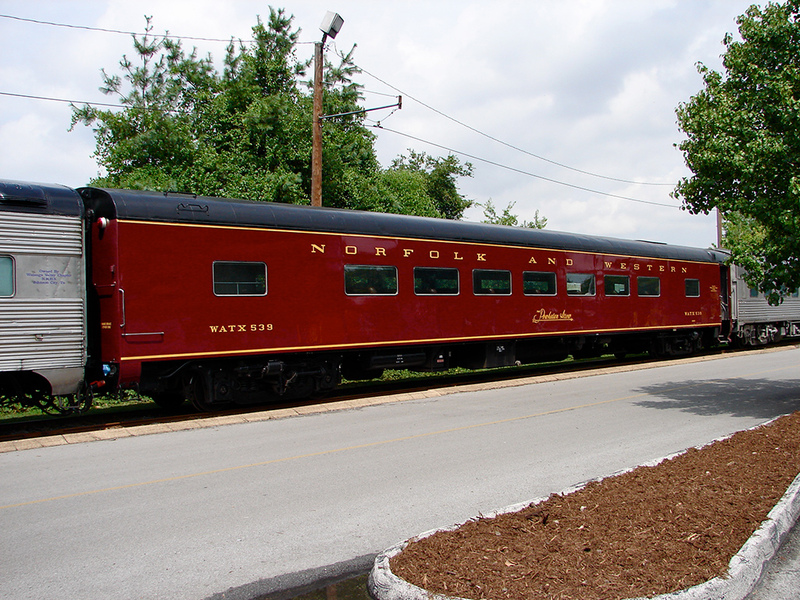 After the N&W passenger service was discontinued in 1971, the car was put into commuter service in Chicago for several years and then retired for storage until 1982 when it was selected for operation in the Norfolk Southern Steam Program. In 1992, the Watauga Valley Chapter NRHS received the coach from NS and completely restored this beautiful example of the glory days of rail passenger service. It was named the Powhatan Arrow and received AAR reporting mark WATX 539 in honor of its service on the N&W.